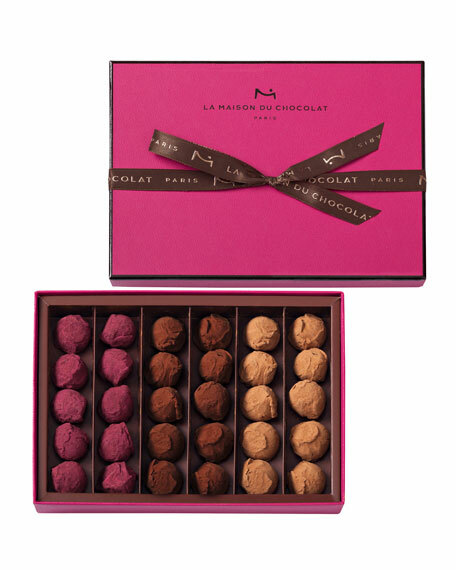 30-piece box of assorted truffles featuring three flavors. Cassis: blackcurrant ganache and blackcurrant pepper. Caramel toffee: caramel ganache with vanilla and Guérande fleur de sel. 8.7"W x 6.1"D x 1.4"T.
Allergen Information: Contains dairy and soy. (see jpgs with info)In 1977, Robert Linxe launched the first Paris boutique devoted entirely to chocolate, where he was quickly dubbed "The Wizard of Ganache." La Maison du Chocolat's logo pays homage to a tool of the Indians, the metate, which is used to grind cocoa beans with a rolling stone.